Here in Davos, the future of work has been one of the hot topics. I’ve heard many points of view – some fear that the robots will come for our jobs, while the optimists look to a future of more benevolent workplaces where human skills rule and workers are liberated from mundane tasks. At LinkedIn, whenever we think about what the future might hold, we start by trying to better understand the present, using the power of our platform. Our Economic Graph – a digital map of the global economy – draws upon the experiences of nearly 600 million LinkedIn members worldwide to identify how the economy is changing. The insights we gain from the Economic Graph can help create an informed public discourse. They can show policymakers, employers, and other stakeholders whether we are on the right track, and where we need to focus our collective efforts. Simply put, understanding today is the first step in building a better tomorrow. In that spirit, here are three insights on the future of work. Studies have estimated that up to 65% of children starting school today will, once they graduate high school or college, hold a job that does not yet exist. Most of the attention in this debate is focused on the jobs in decline – rather than on the creation of new jobs. It’s up to futurologists and science fiction authors to speculate on what the full spectrum of the future may be, but real-time data provides a window into the jobs that are already being created by new technologies. By looking through that window, we can better prepare that incoming class for the economy they’ll meet in a decade and a half's time. 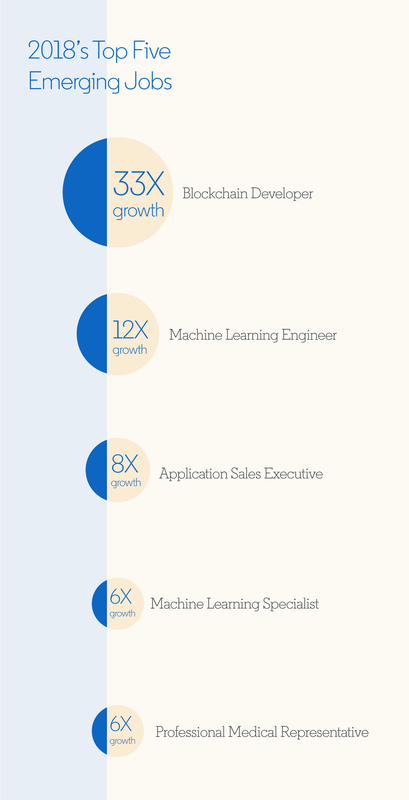 The changing nature of occupations was a central topic in the World Economic Forum’s Future of Jobs report, which used LinkedIn data to identify the top 10 roles experiencing growth (as well as those on the decline), based on global hiring trends. While tech roles, and software engineers in particular, were among the top emerging roles in most regions and industries, we also saw a rise in jobs that require some sort of understanding of human behavior, such as marketing specialists, or the ability to interact with people, in roles like recruiters and HR specialists. Our Emerging Jobs Report found that AI skills in the workforce grew 190% from 2015 to 2017. Six of the 15 emerging jobs identified in the report are related in some way to AI. We can be optimistic that the rise of technology will indeed lead to the creation of new jobs, but they will be jobs that demand different skills, and a different education. The companies, educators and individuals who thrive in that future will be those that are prepared for that change. The skills needed for the workplace of tomorrow are changing, and as leaders we need to be aware of what they are, and help to find solutions. New forms of labour market data tell us that there is no single “skills gap”, but rather a number of gaps that are influenced by a wider array of factors. By some estimates, one third of the skills required by employers will be entirely new by 2020, exacerbating these already endemic skill gaps. While gaps in tech skills lead the headlines, our research has found that soft skills like oral communication, leadership, and time management were among the skills with the biggest gaps in the US. Last year, LinkedIn began publishing a monthly report to reveal location-specific skills gaps across the US and to explore their connection to changing occupations. Our report reveals how some cities have a certain set of skills in surplus, and others in deficit. An individual in the workforce can use that information to learn more about places where their skills are in demand, or find opportunities to reskill. A business can use that same information to make plans to expand a function in a place where the skills needed are more available. A government can use that insight to fine-tune its economic planning efforts. We have also partnered with global organizations to shed light on macro trends in the labour market, joining forces with the Inter-American Development Bank for the most recent G20 summit to demonstrate how individuals could navigate a career path from declining to emerging jobs. We looked at skill characteristics of emerging and declining occupations, coupled with shortest re-skilling paths to move an individual from a declining to an emerging occupation. We believe this research has huge potential to identify new training and career pathway opportunities for economic growth. This third insight is one that requires a more immediate solution. Artificial Intelligence is being adopted in more and more parts of our lives. We may be far from the age of sentient robots, but AI is on the rise (as our Emerging Jobs report indicated) – and leading to growing need for AI skills in a broad range of fields. As the demand for AI skills continues to expand, there is risk that it could perpetuate – and even exacerbate – the gender and equity gaps that have historically plagued the technology sector. In fact, Artificial Intelligence itself could magnify inequality in a cross-section of fields and contexts, as algorithms often reflect the implicit biases of their creators. The challenge we face amidst the rise of AI is that more than three-quarters of AI professionals worldwide are men, as we discovered in our work with WEF on the Global Gender Gap Report. And even for those with the best intentions, unconscious biases impact the way we build, test, maintain, and implement AI tools. As one of LinkedIn’s (female) engineering leaders recently reminded me, this isn’t just about social justice. Achieving a more balanced tech workforce, particularly in fast-growing fields like AI, is about making the most of humanity’s capacity to create and innovate. In the short term, the solution is more awareness – we need to approach these AI tasks cognizant of the biases that might exist within our teams. But beyond that, we need to take active steps to ensure that a diversity of viewpoints are present (gender is just one factor) when we create these tools. Getting to that point is going to take work from many parts of society – we need to create pathways into AI from adjacent areas of science where women are better represented, and we need to inspire young women to study STEM subjects, and pursue a career in AI. We can, and should be, optimistic that new jobs will appear, creating opportunity for workers and job-seekers. But we need to continue to monitor the emergence and persistence of skills gaps, and encourage responses to them at individual, business, and national levels. And most urgently, we need a concerted effort to ensure that the AI foundations laid in the next decade don’t set in stone the bias of one generation, and don’t fail to utilize the potential of all parts of society.